Hi, guys! I’m so excited for the new year and I hope you all had a good holiday! I have been planning and organizing some exciting things over here at B&B and cannot wait to share it all with you. Something that I’ve been excited about lately is my foundation routine so I thought I’d share with you. I use to have the same routine and used the same products throughout the entire year. However, I soon realized that didn’t make sense. That would be like wearing the same clothes year round, you just don’t do that. When it’s cold out, you wear warmer clothes and when it’s raining you wear different boots. 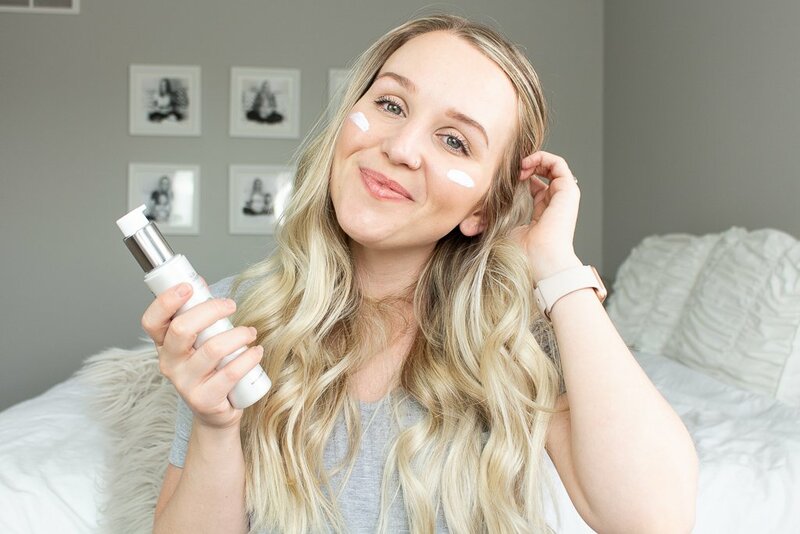 Same goes for your makeup, so here is my flawless winter foundation routine. If you have any dryness right now I highly recommend using the Mario Badescu rosewater spray with your foundation primer. I spray it on all over my face and then apply my primer with a brush. 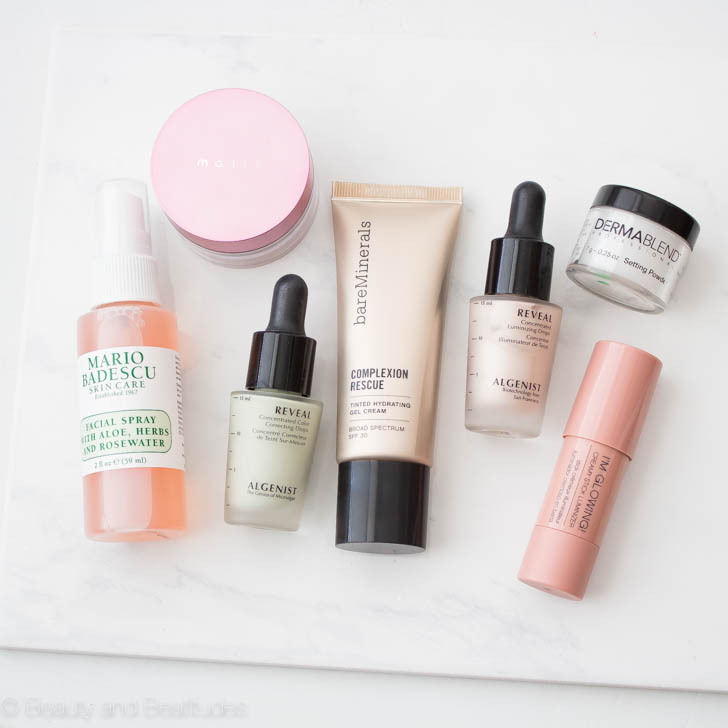 I’ve been going back and forth between this Makeup Forever primer and the Mally perfect prep. Tip: If you have any redness to conceal use these Algenist drops, they’re green to color correct redness. After using my Purlisse BB cream I finally decided to switch it up and try Bare Minerals complexion rescue because I’ve had my eye on it for awhile and it was 50% off at Ulta recently. I have been really impressed. It has a little more coverage than I was expecting which I love, I don’t like heavy full coverage foundations. It also has calcium and magnesium to replenish skin, marine botanicals +other stuff to hydrate, and is SPF 30 so I’m excited to see the long-term results. I’m shade 4.5 which is a light/medium with neutral undertones. The coverage is natural and glowy, I am a little obsessed. Tip: Bounce a damp beauty blender over entire face to blend out your foundation. I can’t finish my face without a highlight and lately, I’ve been loving the Palladio luminizer stick. I love it because it’s a creamy formula that blends really naturally. Palladio is also a super affordable brand and their products are infused with botanicals and vitamins. 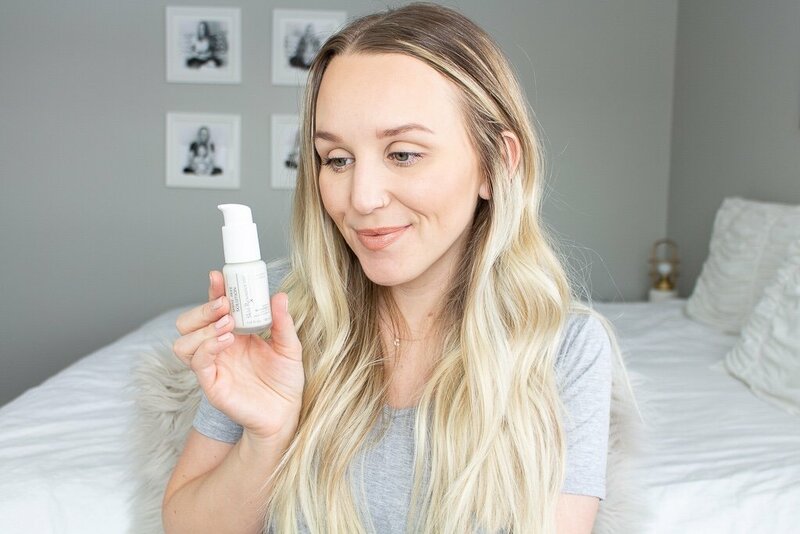 If you follow me on Instagram, you also know I’m obsessed with the Algenist illuminating drops, they come out in a dropper, you can mix them in with foundation/primer, or apply them on top, they blend into a powdery, dreamy, natural finish. *So, again this tip is for all my winter dry skin ladies* After my foundation is all blended out I spray the Mario aloe spray all over again to set my makeup. If you have more oily skin then skip this step and set your foundation with a translucent (talc-free) powder instead, I love this one by Derma Blend. This is my current foundation routine, let me know in the comments if you liked this post and I will try to do more foundation reviews and tutorials like it!